The RockAway Company is Fort Worth’s premier design-build contractor, specializing in home renovation services, commercial remodeling and ADA/MDCP accessibility compliance upgrades. Put your home or business in our capable hands and let us mold a space that’s everything you want it to be and more. Consult with our experienced design team today! Remodeling your home or business is no small decision to make, which means choosing a qualified general contractor in Fort Worth, TX to undertake the task is even more important. Thankfully, The RockAway Company makes it easy! With decades of proven experience and a strong portfolio of satisfied customers, we’re confident in our ability to provide you with truly exceptional remodeling services in Fort Worth, TX. Whether you’re just updating your kitchen or you’re reinventing your entire home to be more in-line with your ideal space, count on us to help. From the initial consultation and design, to planning, to the construction and renovation work itself, we’re with you every step of the way to ensure only the best results. What makes us such a reputable remodeling contractor is more than just our experience—it’s our attention to detail and forethought for our clients. We get to know your needs, wants and expectations early on, which translates into remodeling work that’s illustrative of your unique style, tastes and preferences. And, because we always pay close attention to every detail, the work we do stands out as immaculate! When we’re done, you’ll be left with a space that lives up to your highest expectations in both design and function. We promise the ultimate in comfort, accessibility, quality and beauty—no matter what level of work we’re providing. Check out any of our past projects and we promise you won’t have any reservations in contacting us for your remodeling needs! Our team of designers has more than 30 years of combined experience working to deliver all-inclusive design and remodeling services. We work with both residential and commercial clients, delivering comprehensive contracting services, including planning, design and construction/remodeling. We specialize in ADA/MDCP remodeling, to implement and improve handicap access for residential and commercial buildings. Ready to bring your vision for the perfect space to life? RockAway is ready to help. We’ll make sure the results are everything you expect and more! Contact us today to get started. Our business maintains an A-plus rating with the Better Business Bureau (BBB) and is a proud member of the Texas Association of Builders. Customer service and satisfaction are our top priorities! 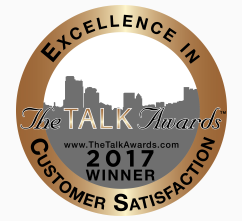 In fact, we’re a recipient of the Excellence in Customer Satisfaction award from The TALK!